Recall a time when you felt the most alone, and invite Jesus to reflect with you. What do you remember? How did you feel then, as compared to how you feel now, re-visiting that time? So I created a little chicken dish at home that resembles greatly the chicken I have come to love and crave so much. I hope you’ll give it a try. So easy. Amazingly delicious. And good for you, to boot! The pic below shows the simple ingredients that make this chicken shine! Put chicken into a large ZipLock bag, or pyrex dish. Pour olive oil over the chicken (I don’t know, 4 – 6 Tablespoons, maybe more). Dump some dried oregano in (Again, I don’t know! A little, a lot – up to you). Sprinkle in some sea salt ( -sigh- about 2 Tablespoons). Zip up the bag and squish it all around. Make sure chicken breasts are oily and season-y. Place in fridge for 2o minutes to two days. Preheat oven at 350 degrees. 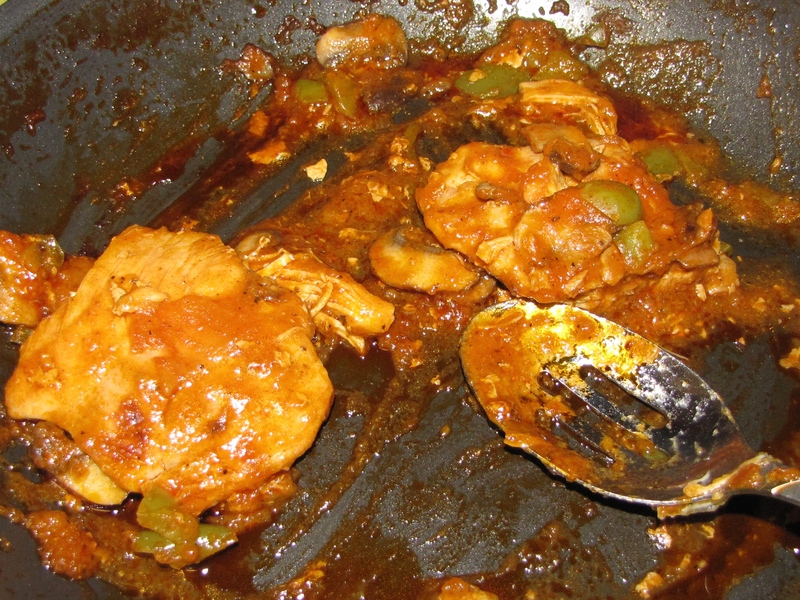 Dump the chicken mixture onto a lined baking pan or dish. Cook uncovered for about 40 minutes. Open oven and add a handful of tomatoes & potatoes & olives. Cook for about 20 minutes more. Squeeze at least 2 fresh lemons over the chicken and veggies. THIS SOUP has been in the making since 1995. My husband and I have been tweaking and perfecting and adding stuff over the years, and we finally have this star soup where it belongs…..CAPITAL DEE Delicious! It is like drinking a cushy, baby wool sweater, ’cause it cozies you up from the inside out…..except unlike a mouth full of wool, this tastes good going down! We eat it ALL YEAR LONG. Seriously! And find that this low calorie, hearty brew is soul soothing in any season. We hope you enjoy it as much as our family does and that you will come to consider it a “staple meal” in your home. Wash your chicken, and pull out that surprise bag inside and discard it. Plop your clean chick in a large stockpot. Peel 4 carrots. Cut in half. Drop in with your chicken. Peel & quarter the onions. Throw them in the pot. Wash & cut in half 2 stalks of celery. Put ’em in, too. Peel your turnip roots. Halve them. Put them in the pot. Dump in some tarragon. Literally. Must be 4-5 TBSPs, at least. Add salt & pepper. You decide how much. You’ll add more to your bowl later. Once boiling, turn it down to medium. Cover with a lid, but tilted to allow for breathing room. Cook this way for about 75 – 90 minutes. Pull your chicken out carefully, and set it aside. It should be falling apart. So good! Strain remaining liquid and vegetables into a new, clean pot. That’s wonderful, health-filled liquid gold! Throw away the strained out veggies when they cool. Lord, please wait until they are cool! I have melted many a trash bag by throwing them out too soon. Put the “new pot” of broth back on the stove. Medium-low. Get it slightly boiling. Dice remaining carrots (4 of them) and celery (2 stalks). Add them to the “new pot”. Cook for about 35 minutes. While this is cooking, you can start pulling your chicken. Yay! Touch that hot thing! You will discard all the bones, skin, cartilage….all the gross stuff. Add the spinach block to your broth. Cook for another 15 minutes. Turn off your stove! You’re almost done! Add the cooled, pulled chicken meat to the pot. Now this seems like a long, complicated recipe, but I assure you it is not! Because of the cook times, you can do other stuff while it’s “simmering”. Sometimes I begin this soup in the morning, and finish it in the evening. Or prepare it over two days! If you have children in the home, or a husband who needs some “substance” in his soup besides some floating green stuff, you can boil noodles on the side and serve this soup on top of them. This makes it NOT Whole30 compliant, but it really pleases a hungry group of teenagers and/or a needy husband (for the record, my man’s been eating this soup noodle free for the last 30-some days!). This is also a great way to sneak greens into your family. “Sneak”, because they can’t really pick them out and the greens are really incognito, except for their give-away color. Don’t be afraid of the turnip roots (see them in the right side of the picture below). Root vegetables really get a bad rap. Or is it wrap? Anyhow – root veggies add a depth of flavor that is remarkable in broth. The vitamins and nutrients are bar none some of the best you’ll find in the veggie market! I use turnip roots because they are usually readily available in our grocery stores here year round, and pretty easy to peel and cut in half. I’ve also used rutabaga, too, and that add’s a nice flavor. A little more strong than the turnip, but nice, none-the-less. If you’re not sure about the flavor, then add just 2 to your broth to begin with. If you like the flavor of the broth, try upping it to 3 or 4 the next go around. I use no less than 5! Adjust the broth to suit your preference. Personally, I don’t enjoy eating turnip root at all, but the flavor it yields in the broth is one I miss if I skip out on the roots. This is the chicken I prefer to use: Nature’s Place, all natural whole chicken. Get it at Food Lion. It’s a little more pricey than run of the mill whole chickens, but so worth the difference in price! Put good things in your body….and your body knows! Potatoes In A Pan, Man! Heat EVOO in a pan over medium heat. Add garlic. Cook 1 minute. Add onions. Stir. Cook 3 minutes. Add potatoes. Stir. Cook 3 minutes. Add green bell peppers. Stir. Cook 3 minutes. Add seasonings. Stir. Add lid. Reduce heat to medium low. Cook 10 minutes. Remove lid. Return to medium heat. Prefer this dish prepared with Red or Yukon Gold potatoes, skin on, but you can use any variety of potato, with skin or naked. Cooking this with the lid off until the potatoes begin to stick to the pan yields a little blackened “crust” on the edges of the veggies. So good! Got these two, giant yellow orb vegetables called spaghetti squash in our farm share this month. I have never in my life even thought about eating one of these, let alone cooking it. For two weeks, the big gourd-looking things lived on my kitchen counter, until meeting their demise yesterday. I stand corrected on every ill-thought I had about these tough-to-cut-into squash giants. What was created using them was FABULOUS! I’m here to tell you that YOU can eat them too, and not only that, YOU can prepare them! It’s not hard, but it is time consuming. Here’s what you do. DO NOT try to cut these beasts in half like so many Pinterest recipes tell you to. Trust me. Don’t. Instead, puncture them with a sharp object, like a skewer or knife, several times, all over. Then put them on a pizza pan or cookie sheet and pop ’em in 375 degree oven on bake. Set your timer for 90 minutes and forget about them. Go watch a movie. Or read a good book. With an hour and a half of free time, you could read four or five magazines cover to cover! When your timer goes off, get those babies out of the oven. Be careful! They are now giant super orbs of heat, certain to be filled with orange lava. Dont’ drop them! Let them cool for a long time. go ahead and set your timer for another 45 minutes or so. And LEAVE THEM ALONE. No good can be done with them whilst they are burning hot. 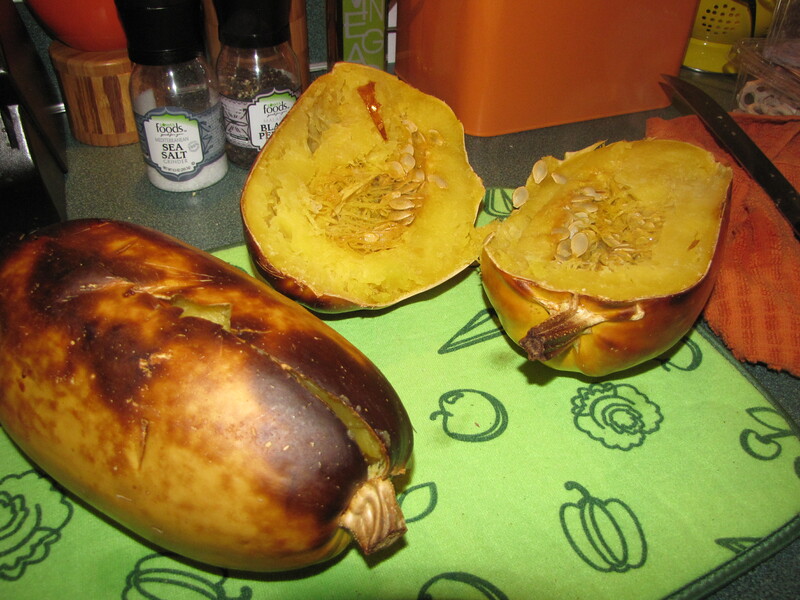 SCRAPE and DISCARD all the seeds in one squash (both halves). SCRAPE the good flesh – the spaghetti looking junk – into the bottom of the casserole dish. SPREAD it all out in a nice, even layer. SLICE 6-8 fresh tomatoes. Matters not the type. Your choice! 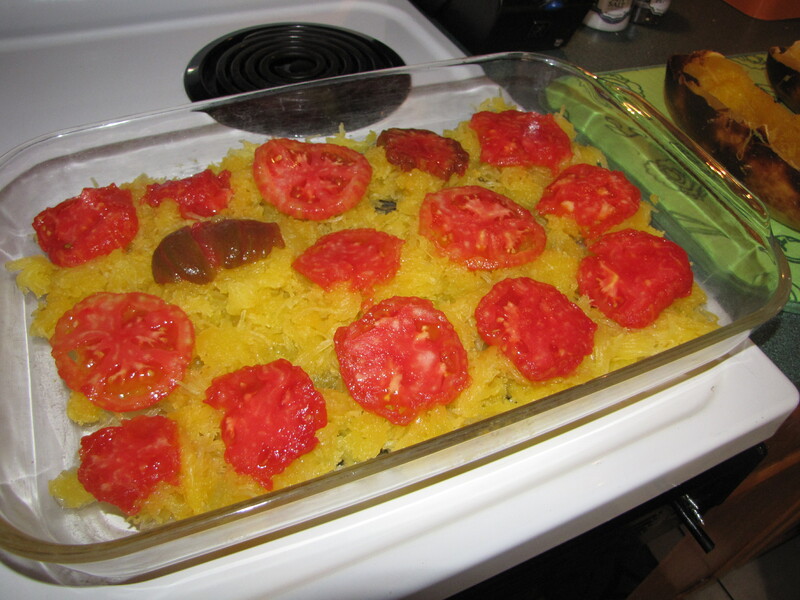 PLACE tomato slices on top of the first layer of spaghetti squash string things. SPRINKLE garlic powder, onion powder, sea salt, black pepper, oregano and basil all over the tops of the tomatoes and the layer of strings. COVER this layer with 1-2 ounces of mozerella cheese. COVER that layer with 2 ounces of parmesan cheese. Easy, huh? And by now your dish should be smelling all Italiany and stuff. SO GOOD! 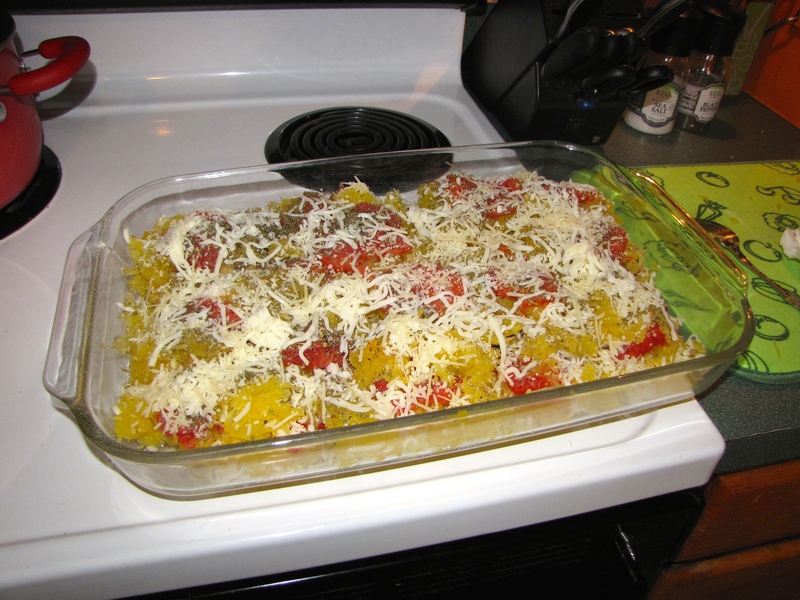 NEXT, cut open the second spaghetti squash and do the same thing. Discarding seeds, scraping flesh out, and then repeat all those steps above…..you’re making the second layer! Make sure you top it all off with as much cheese as you like. And lots of herbs. Cook that junk in a 350 degree oven for 35 minutes – UNCOVERED – and then get ready to chow! It’s so tasty!!! I popped 7 thighs on a baking sheet and put them in the oven for 35 minutes at 350 degrees. OH MY GOODNESS! So yummy! 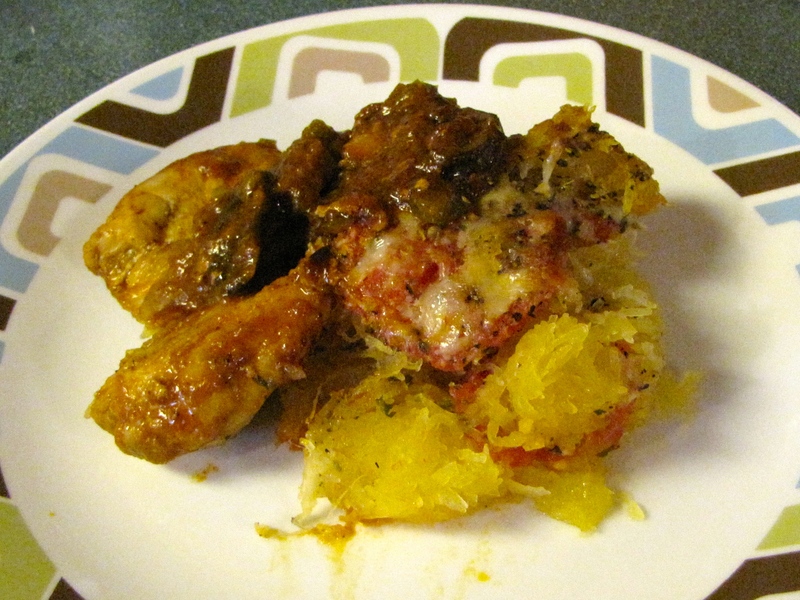 I added a scoop of the chicken thigh stuff to the side of the spaghetti squash stuff, and it made a perfect dish! F – Isn’t this like vacation? What You Wanna Read About?